Principal Contractor to Network Rail – RJ Power Rail – are pleased to announce the completion of a DC Cable Doubling contract on the Woking to Basingstoke Main Line. RJ Power Rail were invited to competitively tender and subsequently secured the full scope of works in early 2018 for the renewal and modification of DC LV Cables and the doubling of identified +ve cables at the Open Route sections/locations between St Johns and Barton Mills Sub-Stations. The line of route was identified as being at particularly high risk of failure, hence the urgent requirement for this project. The third rail electrification system in NR’s Wessex area has large number of DC distribution cables used as part of its traction power system. The age and condition of certain cables and problems with the reliability of lugs had resulted in failures impacting directly on train performance. RJ Power Rail’s contract covered replacement and modification work on positive DC cables to enhance traction power performance in this area, increasing the life expectancy of the cables and reducing the amount of future faulting work for NR’s maintenance teams. During the first part of the works, cables and cable lugs were provided free-issue. During the second part of the works, RJ Power Rail supplied all materials for the works. All materials were delivered to the RJ Power Rail secure facility, which allowed the rail team to deliver a fully logistically managed solution. Works, which were fully managed and self-delivered by RJ Power Rail’s in-house team, required completion during TIII possessions, requiring full access planning and arrangements in conjunction with NR’s Works Delivery Team. 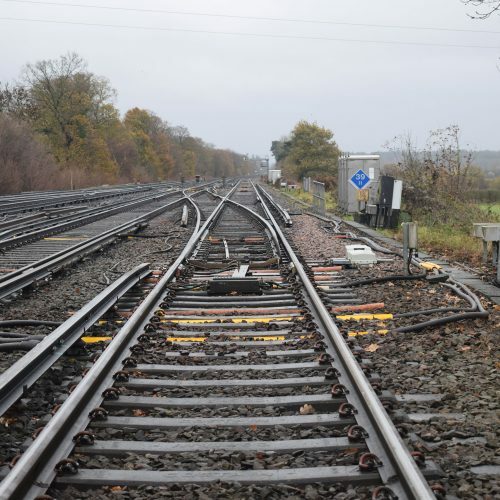 The project was successfully completed at the end of March 2019 to meet Network Rail’s requirements. RJ Power Rail has an established team that combines design, engineering and delivery expertise across all rail electrification activities and can be trusted with the most complex and demanding of projects. The company offers the full range of rail electrification and power services from one-off cable repairs to multi-million-pound HV, LV and Scada D&B projects. They are an experienced power solutions delivery provider who work collaboratively with their clients and own supply chain as a reliable partner, providing exceptional expertise and proven project delivery in respect of HV Electrification and DC Switchgear schemes.